Okay! Musume Time: The Queens are Born! 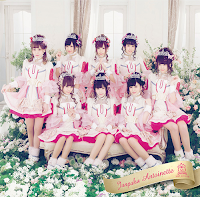 Houkago Princess Release 'Junpaku Antoinette's' Short MV and Covers! The Queens are Born! 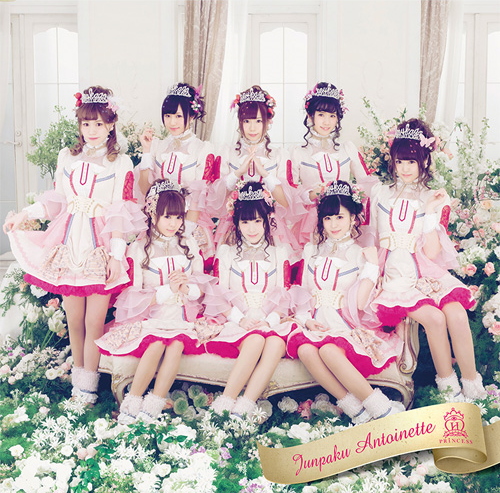 Houkago Princess Release 'Junpaku Antoinette's' Short MV and Covers! 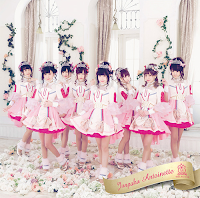 On February 1st 2016, Houkago Princess released the short Music Video for their second singles title song, Junpaku Antoinette! And to say that this was a highly anticipated release for the fans of the HouPri Kingdom is certainly an understatement! A song that celebrates Odagiri Nana's up-coming 26th Birthday (February 18th, 2016) as well as Japan's White Day (March 14th), Junpaku Antoinette is said to be a song full of beautiful grace and yearning that is pure and enchanting. Themed around the iconic French Queen, Marie Antoinette, Houkago Princess take their first step into becoming Queens for this beautiful Music Video whilst indulging in the popular confectionery macarons, and singing amidst scattered rose petals. We also see the return of the story book here, of which was present in Seifuku Cinderella, and are royally transported into a world of beauty and grace that we have yet to see from Houkago Princess, one which I am ready to fall into and indulge in forever more. I am already in love with this Music video. Honestly, just looking at its preview, I can already see that this is going to be one of the best directed Music Videos from the group since... well, since any of their latest Music Videos, because yeah, HouPri are always improving one way or another, whether its in their choreography, or how their videos look. And hey, it seems the terrible lighting situation is gone from Kiete, Shirayukihime, as well as the use of a terrible border... hooray for all! But really, this is such a pretty Music Video, and the song! It's so sweet and sounds just like a chocolate bar commercial, In some ways, it reminds me of Endless Sky, except it has better vocals and feels that little bit more romanticised. I like that about it, and yeah, hearing this song makes me happy... especially knowing that, dang, Nana sounds really freakin' good! I didn't think that would happen any time soon! Also, I am looooving how they went from cute (Seifuku Cinderella) to cool (Kiete, Shirayukihime) to Romantic (Junpaku Antoinette). Their diversity in sound makes me so happy, and their consistency with this Princess / Royal theme makes me even giddier! By the way, have you guys seen these covers yet? They're so regal and poised! These honestly have to be their best costumes yet, they're so fluffy! I mean, I know they use the same kind of style from their previous two costumes, but I do enjoy seeing what the designers will come up with in the end, and honestly? These happen to by my favourite costumes since the Sailor Moon-esque ones used in Smile x3 ~Egao Zutto Saita mama de~. They are just so gorgeous and fluttery, and they don't look cheap! Score! Also, I absolutely adore these covers! I felt that the Kiete, Shirayukihime covers seemed a bit doll like and lifeless, but these ones are definitely a step up and feel a lot more real and gentle. Plus, that backdrop! DANG! Flowers are becoming a somewhat significant theme in their covers as of late though, huh? 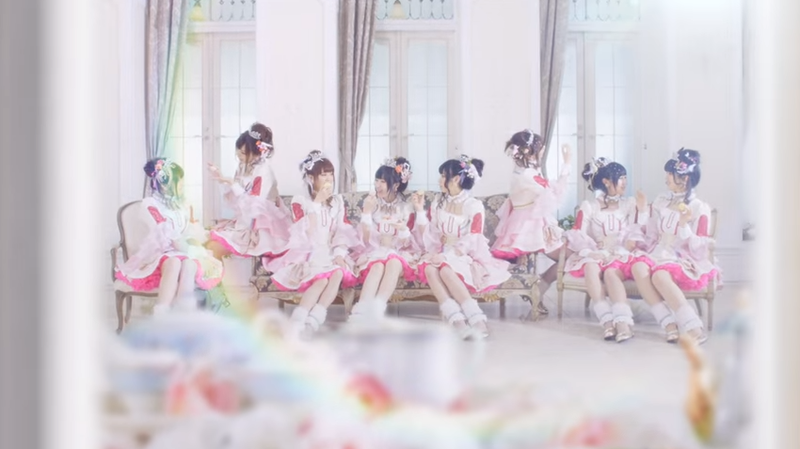 Really though, this PV, the costumes, the song... they make me feel so excited and happy, and I can't wait to see the full version when I can eventually get my hands on it! It's pretty, the video is one of their best, and I think that vocals wise, this is superb for HouPri. They keep stepping up their game, and I am forever left impressed. Seriously, this group... they make me so happy. On a more somber note, Junpaku Antoinette happens to be the final single for 3rd generation member Ayase Miho, who will be leaving this coming March in order to pursue other things in life outside of the entertainment field. I'm sad, considering she is my Top member of HouPri currently, as well as my favourite Idol from all of 2015, however I know that Graduations happen, and this is meant to be. I still love her, and I will miss her, but I know she will have to leave and move on no matter what, and so I will also have to move on, no matter what. I will never forget the happiness she and delight she has brought me. 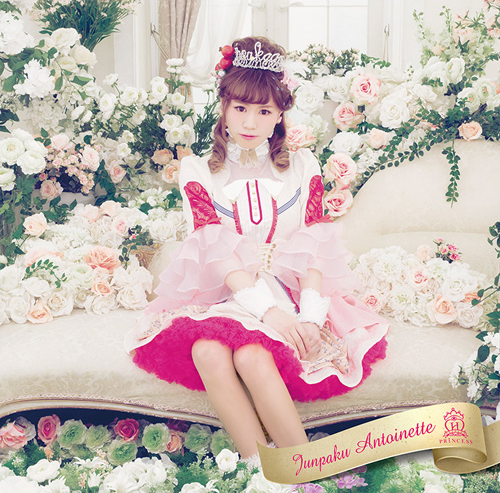 And rounding that up, the b-side for Junpaku Antoinette was recently revealed to be titled Sakura saku, a song that is about graduation. 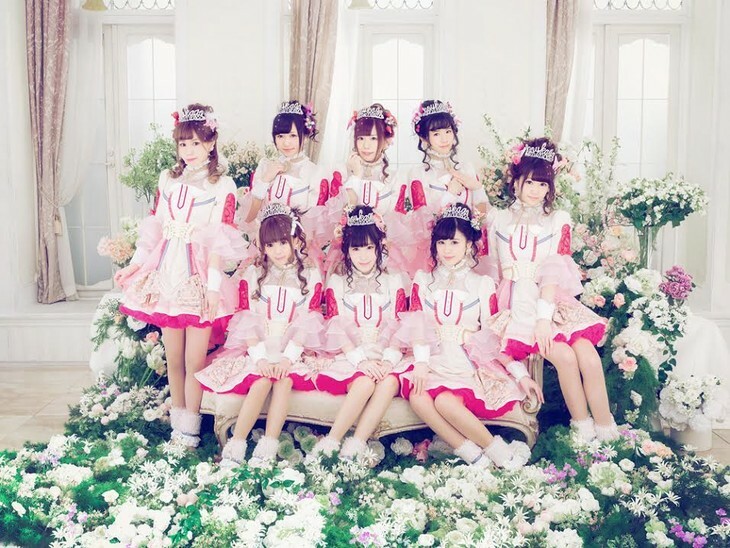 Sakura Saku will be Houkago Princesses second Graduation themed song after Sotsugyoushiki, released back in 2013. Members have stated that during recordings and performances, they cried many tears through the beauty and sadness of the lyrics. And yes, if it's that beautiful, I may cry too... because I will forever know this as Mihotan's final song, her Graduation piece. I pray she gets a solo line in it, at least! A second story is about to begin, and Houkago Princess want to take you along with them! Will you indulge and fall into this beautiful world of Royalty and enchantment? 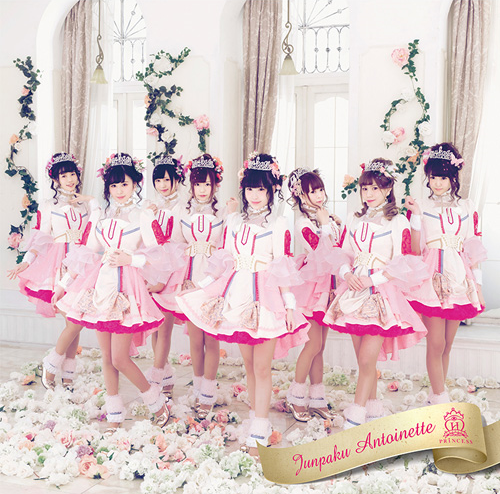 Junpaku Antoinette is set to be released on February 17th 2016, and your royal invitation has been delivered! Let's partake in all the sweets and delight HouPri are sure to deliver! Until next time! Please stay happy, healthy, and always love your Idols! I've even happier now that I got to attend one of their mini-live concerts for this single since Miho is graduating. I didn't even know! I got the opportunity to meet her at the concert too, during the handshake event. She's such a sweet girl, and you can tell she really cares for her fans with the way she talks to you. She'll be missed! !